Think you need two hands to clap? Nah, just one thumb. After all, like most things these days, applause has gone digital. At least it has for Foxdog Studios Ltd. These two genuine IT consultants ask their punters to connect their smartphones to a wireless network so that we can all play a series of silly games and, at one point, we show our appreciation by tapping our screens as fast as we can. Lloyd Henning and Peter Sutton’s loose premise is that, having been faced with a hefty corporation tax bill, they’ve resorted to lecturing on PAT testing to earn some dosh. Here, they’re teaching us ‘how to use electronic devices safely both at home and at work’. Of course, really it’s an excuse to play interactive games projected onto a screen, using our smartphones as joysticks. We dodge a series of falling zeroes, play our own synth solos and ‘draw’ up business plans in a basic version of Microsoft Paint. There’s a charming lo-fi nature to Foxdog’s hi-tech wizardry. 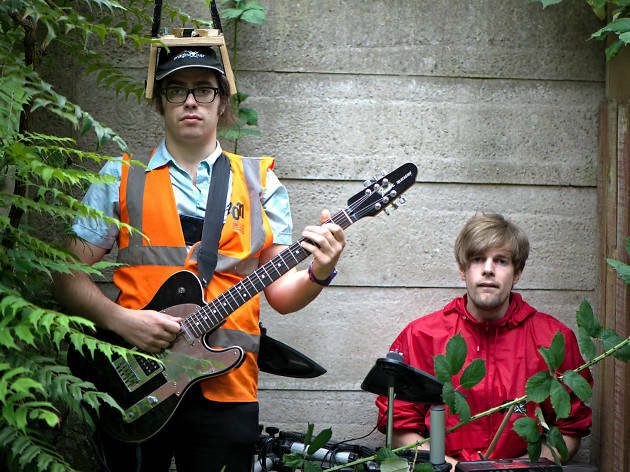 Their series of homemade contraptions – robots, portable TV studios, musical clothing – are made out of bits of wood and bike helmets crudely gaffer taped together. But with a bit of programming magic, it’s amazing what these DIY devices can do. 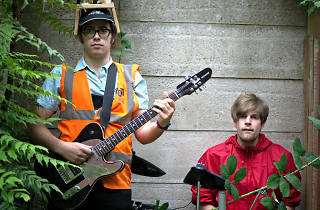 As we play along, the two lovable dweebs belt out songs on a guitar and electric drum kit, like a rock ’n’ roll Flight of the Conchords, before setting up the next game in a deadpan drawl. It’s a mess of a show, both figuratively and literally. Cables litter the floor like health and safety never existed, and the games are gawkily strung together. But it’s also ridiculously good fun and mightily impressive. It’s funny, too. There are goofy jokes about ‘drinkable clothing’ and ‘soft rock cafes’, and we’re all assigned stupid user names (I was ‘Miss Zesty Spanner’). If you don’t enjoy their brand of techy musical comedy, there must be something wrong with your hardware. Try turning yourself off and on again.